Women stage a protest demanding equal pay for women at a 2012 rally in Miami. When it comes to negotiating salaries, the research is pretty clear: women are less assertive than men. It's one reason women who start their careers with a narrower pay gap see it widen over time. Carnegie Mellon economics professor Linda Babcock, who studies the gender pay gap, says men are four times more likely to negotiate their pay. That keeps women at a disadvantage, though they're not always aware of it. "The standard now is that people don't really know what each other earns, that some people negotiate and some people don't, and so there's tremendous inequities in salary," Babcock says. 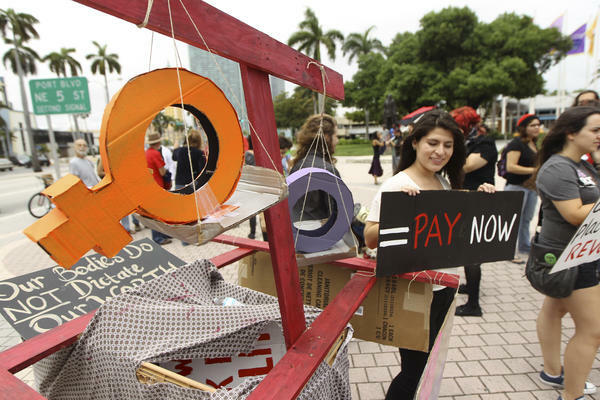 Depending on the government statistics used, women today are paid between 5 percent and 23 percent less than their male counterparts. Many people leapfrog into higher salaries when they switch jobs. But Babcock says the pay disadvantage follows women if their new employers use their old salaries as benchmarks, as is often done. She says in these instances, negotiating can even backfire. "When women do negotiate, people often have a negative reaction to them," Babcock says. At least one company is trying to put a stop to it. Information-sharing site Reddit no longer negotiates salary when it recruits new talent. It's a policy that was instituted by interim CEO Ellen Pao, who last month lost a high-profile gender-discrimination case against her former employer. Ariane Hegewisch, study director at the Institute for Women's Policy Research, says Reddit's policy is a novel concept for the private sector. But, she notes, salaries for most government workers are already set in a similar way. "There is not a very large scope for negotiation," she says. "Whether it will work in the IT industry will be very interesting." Reddit's policy is unusual. Most companies still embrace traditional salary negotiation. Kelly Hastings, senior government affairs adviser for the Society for Human Resource Management, says policies that restrict a company's ability to adjust pay based on skill level or geographic location also limit the talent it can attract — one of the key, traditional mechanisms for recruitment. "We really want employers to have complete flexibility to be able to pay people differently as they deem necessary," she says. Author and career counselor Robin Ryan says it's not that companies do not want to see women rise through their ranks. "Wanting to have more women promoted, now that [most companies] do care about, and that they have been showing a lot of interest in," she says. "That I'm seeing happening more and more and more." But Ryan says that tends not to bridge the pay gap. Women are less aggressive on compensation, and that means women stay behind their male peers throughout their careers. But now workers have access to sites like Glassdoor, which publishes salary information. HR consultant Amy Hirsh Robinson says greater transparency is forcing companies to change. "Some of my clients are now making all of their salaries transparent, up to the executive level," she says. That includes Elevations Credit Union, based in Boulder, Colo. The company sets salary level based on title, which it publishes online. So effectively, there is no salary negotiation during hiring or promotion. Annette Matthies heads human resources and says Elevations did this after hearing complaints from employees. She says it also has helped with recruitment and retention. "And that loyalty then increases profits for our company," she says. "The company's more profitable, they can then give back more to their employees, and so it's a symbiotic relationship." In fact, Elevations' last salary audit showed women at the company earn 2 percent more than men. And, Matthies says, no one misses the negotiation process. Some companies are taking a new approach to a long-standing trend. Women are consistently paid less than men. Research shows that women are less assertive in negotiating salaries. That means they start out making less and only see the gap widen over time. The solution for some companies is simply refusing to negotiate with anyone. NPR's Yuki Noguchi reports. YUKI NOGUCHI, BYLINE: Carnegie Mellon economics professor Linda Babcock studies the gender pay gap and says men are four times more likely to negotiate their pay. That keeps women at a disadvantage, though they're not always aware of it. LINDA BABCOCK: The standard now is that people don't really know what each other earns, that some people negotiate it and some don't. And so there is tremendous inequities in salary. NOGUCHI: Depending which government statistics you use, women today are paid between 5 and 23 percent less than their male counterparts. Many people leapfrog into higher salaries when they switch jobs. But Babcock says the pay disadvantage follows women if their new employers use their old salaries as benchmarks, as is often done. Negotiating, she says, can even backfire. BABCOCK: When women do negotiate, people often have a negative reaction to them. NOGUCHI: At least one company recently decided to eliminate the negotiation. Information-sharing site Reddit no longer negotiates salary when it recruits. It's a policy instituted by interim CEO Ellen Pao, who last month lost a high-profile gender discrimination case against her former employer. ARIANE HEGEWISCH: I think it's an interesting experiment. NOGUCHI: Ariane Hegewisch is study director at the Institute for Women's Policy Research. She says Reddit's policy is a novel concept for the private sector. But, she notes, salaries for government workers are usually set in a similar way. HEGEWISCH: There is not a very large scope for negotiation. Whether it will work in the IT industry will be very interesting. NOGUCHI: Reddit's policy is unusual. Most companies still embrace the traditional salary negotiation. Kelly Hastings is senior government affairs adviser for the Society for Human Resource Management. She says policies that restrict a company's ability to adjust pay based on skill level or geographic location also limits the talent it can attract, one of the key, traditional mechanisms for recruitment. KELLY HASTINGS: We really want employers to have complete flexibility to be able to pay people differently as they deem necessary. NOGUCHI: Author and career counselor Robin Ryan says it's not that companies do not want to see women rise through their ranks. ROBIN RYAN: Wanting to have more women promoted - now, that they do care about. And that they have been showing a lot of interest in. That I'm seeing happening more and more and more. NOGUCHI: But Ryan says that tends not to bridge the pay gap. She says here again, women are less aggressive on compensation. And that means women stay behind their male peers throughout their careers. HR consultant Amy Hirsh Robinson says, however, that workers now have access to sites like Glassdoor that publish salary information. And, she says, greater transparency is forcing companies to change. AMY HIRSH ROBINSON: Some of my clients are now making all of their salaries transparent, up to the executive level. NOGUCHI: That includes Elevations, a credit union based in Boulder, Colo., that sets salary level based on title, which it publishes online. So effectively, there is no salary negotiation during hiring or promotion. Annette Matthies heads human resources and says the company did this after hearing complaints from employees. She says it's also helped with recruitment and retention. ANNETTE MATTHIES: And that loyalty then increases profits for a company. The company's more profitable. They can then give back more to their employees. And so it's a symbiotic relationship. NOGUCHI: Interestingly, the company's last salary audit showed women at the company earning 2 percent more than men. And, Matthies says, no one misses the negotiation. Yuki Noguchi, NPR News, Washington. Transcript provided by NPR, Copyright NPR.